Challenges Action: If you are the first player, kneel Raiding Longship to choose a defending character without attachments. That character does not contribute its STR to this challenge. The Road to Winterfell #32. This card is great. Being able to stealth or balon most of their guys and Raiding Longship the leftovers makes unopposed a lot easier to achieve. Also, this card isn't even unique and gets even more ridiculous in multiples. 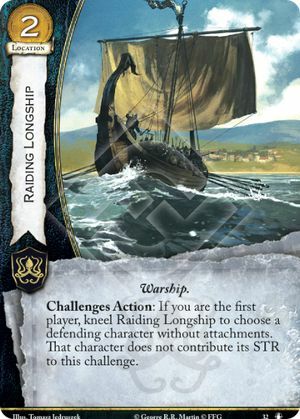 The first raiding longship makes it easier to get a second one (or a Great Kraken) via Support of the People. Cheap attachments like little bird and widow's wail are a good counter, but only if you can get a critical mass of them or can put them on characters who also have stealth. A devastating card when combined (in multiples) with The Seastone Chair! Opponents will have a very hard time managing opposition to military challenges and this may cripple their ability to play out their own game plans. Just be sure to go first!